Circular insignia: Eagle with wings outstretched holds olive branch on Moon with Earth in background, in blue and gold border. အပိုလို ၁၁ ကို ဖလော်ရီုဒါရှိ ကနေဒီအာကာသစခန်းမှ ၁၉၆၉ ခုနှစ် ဇူလိုင် ၁၆ ရက်နေ့၊ နိုင်ငံတကာစံတော်ချိန် ၂၀:၁၈တွင် လွှတ်တင်ခဲ့သည်။Launched by a Saturn V rocket from Kennedy Space Center in Merritt Island, Florida on July 16, Apollo 11 was the fifth manned mission of NASA's Apollo program. The Apollo spacecraft had three parts: a Command Module with a cabin for the three astronauts which was the only part which landed back on Earth; a Service Module which supported the Command Module with propulsion, electrical power, oxygen and water; and a Lunar Module for landing on the Moon. After being sent to the Moon by the Saturn V's upper stage, the astronauts separated the spacecraft from it and travelled for three days until they entered into lunar orbit. Armstrong and Aldrin then moved into the Lunar Module and landed in the Sea of Tranquility. They stayed a total of about 21 and a half hours on the lunar surface. After lifting off in the upper part of the Lunar Module and rejoining Collins in the Command Module, they returned to Earth and landed in the Pacific Ocean on July 24. Broadcast on live TV to a world-wide audience, Armstrong stepped onto the lunar surface and described the event as "one small step for [a] man, one giant leap for mankind." Apollo 11 effectively ended the Space Race and fulfilled a national goal proposed in 1961 by the late U.S. President John F. Kennedy in a speech before the United States Congress, "before this decade is out, of landing a man on the Moon and returning him safely to the Earth." The Apollo 11 mission insignia was designed by Collins, who wanted a symbol for "peaceful lunar landing by the United States." He chose an eagle as the symbol, put an olive branch in its beak, and drew a lunar background with the Earth in the distance. NASA officials said the talons of the eagle looked too "warlike" and after some discussion, the olive branch was moved to the claws. The crew decided the Roman numeral XI would not be understood in some nations and went with "Apollo 11;" they decided not to put their names on the patch, so it would "be representative of everyone who had worked toward a lunar landing." A Saturn V launched Apollo 11 from Launch Pad 39A, part of the Launch Complex 39 site at the Kennedy Space Center on July 16, 1969 at 13:32:00 UTC (9:32:00 a.m. EDT local time). It entered orbit 12 minutes later. After one and a half orbits, the S-IVB third-stage engine pushed the spacecraft onto its trajectory toward the Moon with the Trans Lunar Injection burn at 16:22:13 UTC. About 30 minutes later the command/service module pair separated from this last remaining Saturn V stage and docked with the lunar module still nestled in the Lunar Module Adaptor. After the lunar module was extracted, the combined spacecraft headed for the Moon, while the third stage booster flew on a trajectory past the Moon and into heliocentric orbit. On July 19 at 17:21:50 UTC, Apollo 11 passed behind the Moon and fired its service propulsion engine to enter lunar orbit. In the thirty orbits that followed, the crew saw passing views of their landing site in the southern Sea of Tranquility (Mare Tranquillitatis) about 20 kilometres (12 mi) southwest of the crater Sabine D (0.67408N, 23.47297E). The landing site was selected in part because it had been characterized as relatively flat and smooth by the automated Ranger 8 and Surveyor 5 landers along with the Lunar Orbiter mapping spacecraft and unlikely to present major landing or extra-vehicular activity (EVA) challenges. Lunar descent The Eagle in lunar orbit after separating from Columbia. When Armstrong again looked outside, he saw that the computer's landing target was in a boulder-strewn area just north and east of a 300 metres (980 ft) diameter crater (later determined to be "West crater", named for its location in the western part of the originally planned landing ellipse). Armstrong took semi-automatic control and, with Aldrin calling out altitude and velocity data, landed at 20:17 UTC on July 20 with about 25 seconds of fuel left. Apollo 11 landed with less fuel than other missions, and the astronauts also encountered a premature low fuel warning. This was later found to have been due to greater propellant 'slosh' than expected, uncovering a fuel sensor. On subsequent missions, extra baffles were added to the tanks to prevent this. Armstrong acknowledged Aldrin's completion of the post landing checklist with "Engine arm is off." before responding to Duke with the words, "Houston, Tranquility Base here. The Eagle has landed." Armstrong's change of call sign from "Eagle" to "Tranquility Base" confirmed that landing was complete and successful, and Duke mispronounced his reply as he expressed the relief at Mission Control: "Roger, Twan-- Tranquility, we copy you on the ground. You got a bunch of guys about to turn blue. We're breathing again. Thanks a lot." "This is the LM pilot. I'd like to take this opportunity to ask every person listening in, whoever and wherever they may be, to pause for a moment and contemplate the events of the past few hours and to give thanks in his or her own way." He then took communion privately. At this time NASA was still fighting a lawsuit brought by atheist Madalyn Murray O'Hair (who had objected to the Apollo 8 crew reading from the Book of Genesis) demanding that their astronauts refrain from broadcasting religious activities while in space. As such, Aldrin chose to refrain from directly mentioning taking communion on the moon. Aldrin was an elder at the Webster Presbyterian Church and his communion kit was prepared by the pastor of the church, the Rev. Dean Woodruff. Aldrin described communion on the Moon and the involvement of his church and pastor in the October 1970 edition of Guideposts magazine and in his book Return to Earth. Webster Presbyterian possesses the chalice used on the Moon and commemorates the event each year on the Sunday closest to July 20. 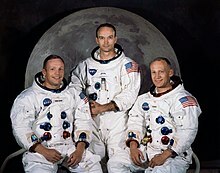 The schedule for the mission called for the astronauts to follow the landing with a five-hour sleep period, since they had been awake since early morning. However, they elected to forgo the sleep period and begin the preparations for the EVA early, thinking that they would be unable to sleep. Lunar surface operations See also: First Moon walk A mounted slowscan TV camera shows Armstrong as he climbs down the ladder to surface. After describing the surface dust as "very fine-grained" and "almost like a powder", Armstrong stepped off Eagle's footpad and uttered his famous line, "That's one small step for [a] man, one giant leap for mankind" six and a half hours after landing. Aldrin joined him, describing the view as "Magnificent desolation." "That's one small step..." Menu 0:00 Problems listening to this file? See media help. In addition to fulfilling President John F. Kennedy's mandate to land a man on the Moon before the end of the 1960s, Apollo 11 was an engineering test of the Apollo system; therefore, Armstrong snapped photos of the LM so engineers would be able to judge its post-landing condition. He removed the TV camera from the MESA and made a panoramic sweep, then mounted it on a tripod 68 feet (21 m) from the LM. The TV camera cable remained partly coiled and presented a tripping hazard throughout the EVA. Aldrin poses on the Moon, allowing Armstrong to photograph both of them using the visor's reflection. ကမ္ဘာ့ဆွဲအား၏ ၁/၆ သာရှိသော လဆွဲအားအောက်တွင်လှုပ်ရှားရသည်မှာ အတုပြုလုပ်လေ့ကျင့်ခဲ့သည်ထက်ပိုမိုလွယ်ကူကြောင်း၊ လှည့်လည်သွားလာရန်အတွက်မည်သည့်လုံးဝအခက်အခဲမရှိကြောင်း အမ်းစထရောင်းကဆိုသည်။  Aldrin joined him on the surface and tested methods for moving around, including two-footed kangaroo hops. The PLSS backpack created a tendency to tip backwards, but neither astronaut had serious problems maintaining balance. Loping became the preferred method of movement. The astronauts reported that they needed to plan their movements six or seven steps ahead. The fine soil was quite slippery. Aldrin remarked that moving from sunlight into Eagle's shadow produced no temperature change inside the suit, though the helmet was warmer in sunlight, so he felt cooler in shadow. The astronauts planted a specially designed U.S. flag on the lunar surface, in clear view of the TV camera. Some time later, President Richard Nixon spoke to them through a telephone-radio transmission which Nixon called "the most historic phone call ever made from the White House." Nixon originally had a long speech prepared to read during the phone call, but Frank Borman, who was at the White House as a NASA liaison during Apollo 11, convinced Nixon to keep his words brief, to respect the lunar landing as Kennedy's legacy. They deployed the EASEP, which included a passive seismograph and a laser ranging retroreflector. Then Armstrong loped about 120 metres (390 ft) from the LM to snap photos at the rim of Little West Crater while Aldrin collected two core tubes. He used the geological hammer to pound in the tubes - the only time the hammer was used on Apollo 11. The astronauts then collected rock samples using scoops and tongs on extension handles. Many of the surface activities took longer than expected, so they had to stop documenting sample collection halfway through the allotted 34 min. During this period Mission Control used a coded phrase to warn Armstrong that his metabolic rates were high and that he should slow down. He was moving rapidly from task to task as time ran out. However, as metabolic rates remained generally lower than expected for both astronauts throughout the walk, Mission Control granted the astronauts a 15-minute extension. Lunar ascent and return Aldrin next to the Passive Seismic Experiment Package with Eagle in the background. Aldrin entered Eagle first. With some difficulty the astronauts lifted film and two sample boxes containing more than 22 kilograms (49 lb) of lunar surface material to the LM hatch using a flat cable pulley device called the Lunar Equipment Conveyor. Armstrong reminded Aldrin of a bag of memorial items in his suit pocket sleeve, and Aldrin tossed the bag down; Armstrong then jumped to the ladder's third rung and climbed into the LM. After transferring to LM life support, the explorers lightened the ascent stage for return to lunar orbit by tossing out their PLSS backpacks, lunar overshoes, one Hasselblad camera, and other equipment. They then pressurized the LM, and settled down to sleep. They also left behind a memorial bag containing a gold replica of an olive branch as a traditional symbol of peace and a silicon message disk. The disk carries the goodwill statements by Presidents Eisenhower, Kennedy, Johnson and Nixon and messages from leaders of 73 countries around the world. The disc also carries a listing of the leadership of the US Congress, a listing of members of the four committees of the House and Senate responsible for the NASA legislation, and the names of NASA's past and present top management. (In his 1989 book, Men from Earth, Aldrin says that the items included Soviet medals commemorating Cosmonauts Vladimir Komarov and Yuri Gagarin.) Also, according to Deke Slayton's book Moonshot, Armstrong carried with him a special diamond-studded astronaut pin from Slayton. Eagle's ascent stage approaching Columbia. After rendezvous with Columbia, Eagle's ascent stage was jettisoned into lunar orbit on July 21, 1969 at 23:41 UTC. Just before the Apollo 12 flight, it was noted that Eagle was still likely to be orbiting the Moon. Later NASA reports mentioned that Eagle's orbit had decayed, resulting in it impacting in an "uncertain location" on the lunar surface. The location is uncertain because the Eagle ascent stage was not tracked after it was jettisoned, and the lunar gravity field is sufficiently non-uniform to make the orbit of the spacecraft unpredictable after a short time. NASA estimated that the orbit had decayed within months and would have impacted on the Moon. At 16:44 UTC the drogue parachutes had been deployed and 7 minutes later the command module struck the water forcefully. The command module landed upside down but was righted within 10 minutes by flotation bags triggered by the astronauts. "Everything's okay. Our checklist is complete. Awaiting swimmers," was Armstrong's last official transmission from the Columbia. A diver from the Navy helicopter hovering above attached a sea anchor to the command module to prevent it from drifting. Additional divers attached flotation collars to stabilize the module and position rafts for astronaut extraction. Though the chance of bringing back pathogens from the lunar surface was considered remote, it was considered a possibility and NASA took great precautions at the recovery site. Divers provided the astronauts with Biological Isolation Garments (BIGs) which were worn until they reached isolation facilities on board the Hornet. Additionally astronauts were rubbed down with a sodium hypochlorite solution and the command module wiped with Betadine to remove any lunar dust that might be present. The raft containing decontamination materials was then intentionally sunk. A second Sea King helicopter hoisted the astronauts aboard one by one, where a NASA flight surgeon gave each a brief physical check during the 0.5 nautical miles (930 m) trip back to the Hornet. The crew of Apollo 11 in quarantine after returning to Earth, visited by Richard Nixon. President Richard Nixon was aboard Hornet to personally welcome the astronauts back to Earth. He told the astronauts, "As a result of what you've done, the world has never been closer together before." After Nixon departed, the Hornet was brought alongside the five-ton command module where it was placed aboard by the ship's crane, placed on a dolly and moved next to the MQF. The Hornet sailed for Pearl Harbor where the command module and MQF were airlifted to the Johnson Space Center. Years later, it was publicly revealed that Nixon had prepared a speech to be given in the event the Lunar Module had failed to lift off from the lunar surface, which would have resulted in Armstrong's and Aldrin's deaths, similar to common newspaper obituary or government contingency plan procedures and policies. On August 13, they rode in parades in their honor in New York, Chicago, and Los Angeles. On the same evening in Los Angeles there was an official State Dinner to celebrate the flight, attended by members of Congress, 44 governors, the Chief Justice of the United States, and ambassadors from 83 nations at the Century Plaza Hotel. President Richard Nixon and Vice President Spiro T. Agnew honored each astronaut with a presentation of the Presidential Medal of Freedom. This celebration was the beginning of a 45-day "Giant Leap" tour that brought the astronauts to 25 foreign countries and included visits with prominent leaders such as Queen Elizabeth II of the United Kingdom. Many nations would honor the first manned Moon landing by issuing Apollo 11 commemorative postage stamps or coins. In March 2012 Amazon founder Jeff Bezos located the F-1 engines that launched Apollo 11 into space. The engines were found below the Atlantic Ocean's surface through the use of advanced sonar scanning. His team plans to bring at least one of the five engines to the surface. 40th anniversary events Mike Simons, director of the National Electronics Museum, assembles an Apollo TV camera for display at the Newseum. From July 16–24, 2009 NASA streamed the original mission audio on its website in real time 40 years to the minute after the events occurred. In addition, it is in the process of restoring the video footage and has released a preview of key moments. The John F. Kennedy Library set up a Flash website that rebroadcasts the transmissions of Apollo 11 from launch to landing on the Moon. The Washington Post on Monday, July 21, 1969: "The Eagle Has Landed—Two Men Walk on the Moon"
Neil Armstrong's certification: "the world scout badge was carried to the surface of the Moon".